Samson Awnings & Terrace Covers are the leading supplier and installer of specialist domestic & commercial sun shading equipment in the Northamptonshire area. We offer products ranging from patio awnings and umbrellas right through to commercial fixed and retractable roof cover systems for large hotels or restaurants to create extra outdoor covered space for use all year round. Most products are purpose made to size to fully utilise the outdoor area and provide the most durable solution to deal with our UK climate. We have an extensive showroom in Wellingborough, Northamptonshire with fully operational awning models, retractable roof systems and a glass room.We have full ranges of fabric samples and professional knowledge from our experienced sales department. We welcome you to enquire about any details you require and will gladly provide you with a free survey and prices. Samson Awnings & Terrace Covers specialise in the sale, supply, installation and servicing of patio awnings for domestic or commercial applications. All of the Patio Awnings we supply around Northamptonshire are fully retractable and are available with full cassette, semi cassette or open cassette covers to protect against the sun. This enables you to enjoy the shade and shelter which a patio awning provides in small or very large sizes up to 14 metres wide!! Whilst being able to effectively offer sun protection, our patio awnings are available with a variety of different material covers to offer effective shade against sun glare and the rain. A waterproof patio awning allows you to remain outdoors even during the rain keeping your patio dry and your mind at ease when arranging parties, events or barbeques. We only deal with European manufacturers and models of the highest quality to ensure that the best performance possible is provided for many years to come and that you remain deeply satisfied after dealing with us. All of our patio cover products offer high quality sun shading at extremely affordable and honest Samson sun awning prices. Even though sun awnings are designed for use to block the sun, they are also designed to withstand light rainfall when used to cover an entertainment area at night. With in-built tilting halogen lamps, our sun awnings with LED lights can be quickly extended and brighten up any area with the simple click of a remote control handset. 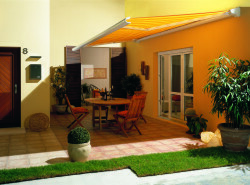 Terrace & Patio Covers are the ideal solution to all weather protection for both domestic and commercial environments. With their unique adaptability, our solid structure canopies can be installed almost anywhere and everywhere. No product demonstrates this more than our Samson Piazza Patio Cover System. A fixed system in purpose made sizes the Piazza will give protection from all weathers all year round with the possibility of adding protective blinds or glass sliding doors to the sides and front as required. In a domestic environment our fine terrace covers can offer you effective sun shading in the summer and unrivalled waterproof protection in the winter – this is all thanks to our fantastic choice of either polycarbonate or glass roofing panels to both personalise and enhance your garden entertainment area allowing you to use it all year round. In a commercial environment our terrace covers allows pubs, restaurants, hotels, schools and more to fully take advantage of their outdoor areas and allow guests to fully embrace the natural light and enjoy the fresh air whilst still being protected from the weather. Extra space outdoors covered for extended use. Our Large Umbrellas & Giant Parasols are some of the most agile products on the market. We supply and install a range of high quality umbrellas capable of spanning up to 70m². We specialise in the supply and installation of two main types of large umbrellas & giant parasols in various shapes – round, square, rectangular and octagonal. Centre Pole Umbrellas are fixed to a supporting pole in the centre and are highly popular in dining areas where a table can be inserted around the supporting poles. Fixed or moveable bases are available for all sizes of umbrellas sold. 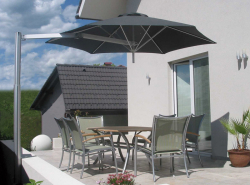 Cantilever Umbrellas (pictured right) offer more room underneath the shading canopy as they have a side-arm construction which allows them to offer practical shading over an area without the obstruction of a supporting pole. Carports offer unobtrusive driveway cover with the use of a simple canopy and standing support structure. 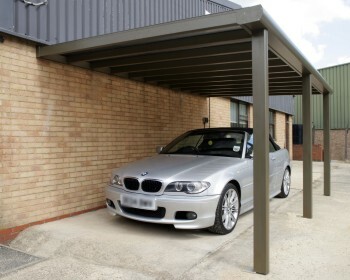 Our Carports require installation against an already existing wall however this enables you to park closer to your home. A Samson Carport allows you to conveniently park your car whilst being protected from the scorching sun or the freezing rain. Our carports vary in size from small Carports, medium sized Carports all the way to infinitely sized Carports thanks to their unique ability to be coupled together multiple times. 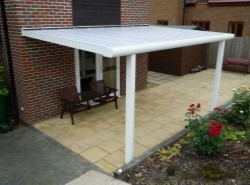 The large waterproof canopy is supported by steel columns which offer strenuous support. This enables it to offer continuous support through all types of weather whilst still offering sun shading and rain protection to your car. Our Carport (pictured right) is located in our Wellingborough showroom and is available to view on appointment. For more information, please contact us. 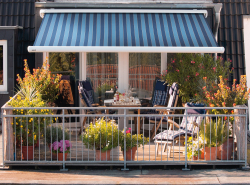 Samson Awnings use only high quality proven manufacturers to provide the optimum level in performance, durability and comfort for your money. Each manufacturers products we supply are tested first for durability and suitability and we only ever supply and install the highest quality products to offer you the longest life span on your investment.